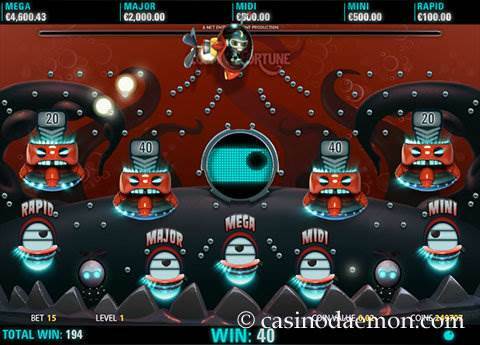 Cosmic Fortune is a video slot from the developer Net Entertainment. The game is set in space and reminds of the famous arcade game Space Invaders from 1978. Especially the intro gives a good impression of the idea of the game! The bonus game, however, is a mix of space ships and marbles that fall from the sky and bounce around just like the balls in a pinball machine. The game does not have reels, instead it uses symbols that fall from the top of the screen. Once you have a winning combination the symbols will disappear and the top symbols will fill their places. This will give you another chance for a winning combination, and this is called avalanche feature. The symbol are of an astronaut, aliens, robots, a moon and a spaceship, and the quality is outstanding. The background music is dreamy space music that reminds of fantasy space games. The theoretical return to player is at 96.9%, which is relatively high for a online slot game. Overall, the game is very well made, and with two special bonus games you even get the chance of winning one of 5 jackpots. The game is great fun to play, and especially the bonus games will keep you on the edge of your seat! 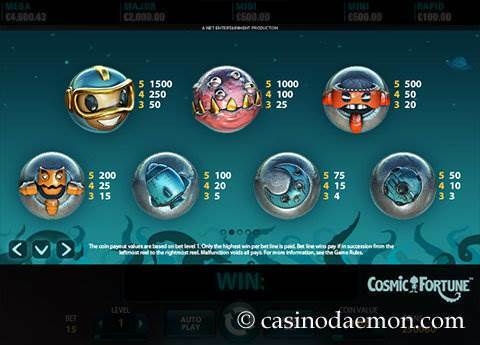 Unfortunately, mobile players are not yet able to try their luck on Cosmic Fortune, as the slot hasn't been optimised for mobile play yet. Are you ready to collect the cosmic winnings? 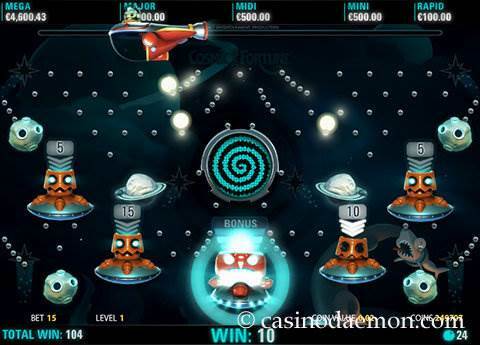 If you are not sure about the game, play Cosmic Fortune for free without obligation. If you like the game and want to play it for real money, you can find it in one of the casinos on this page. To load the game please confirm that you are over 18 years old. No, I'm not over 18! Game not displayed properly? Try it in fullscreen! The game has a wild symbol that can appear on reels 2, 3 and 4, and it replaces other symbols for winning combinations, but it doesn't replace the scatter symbol. The scatter symbol is the golden ball with the S. Three scatters anywhere on the screen will start 10 free falls, and each additional scatter will add +5 free falls. The free falls start right after the avalanche ends. The free falls game consists of two parts. Firstly, during the free falls bonus game, all the symbols of winning combinations are transformed into marbles and collected for the next round. Secondly, when the free falls are finished, bonus game 1 starts. In this game the previously collected marbles will fall from the top and hopefully land in either coin cups, or the jackpot collector cup. If you are lucky and get 3 marbles in the jackpot cup the bonus game 2 will be started when the first one finishes. In the second bonus game you can win one of five jackpots or more coin wins. There are 3 progressive jackpots, and 2 fixed jackpots, and you need three marbles in the jackpot cup in order to win it. 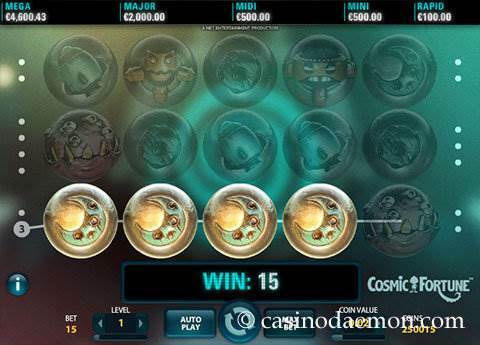 The Cosmic Fortune slot from Netent has 5 reels and 15 fixed paylines. You can select coin values of between 0.02 and 0.50 £/€/$ and play between 1 and 10 coins per line. The minimum wager is 0.30 £/€/$ and the maximum is 75 £/€/$. You can win up to 1,470,000 coins in just one spin.